What used to be a haven for all things heavenly suddenly had a backdrop for everything rock and roll. 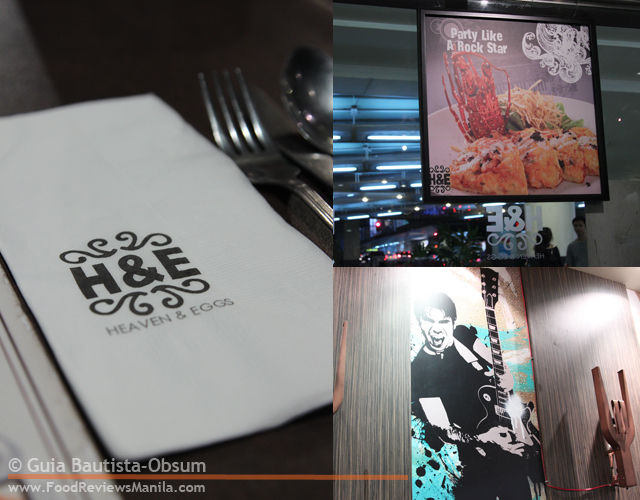 A few years ago, when you'd enter Heaven & Eggs in Glorietta, you'd immediately be transported to that light and cloudy place up in the air; where chairs and tables are wooden and white, some would even be two-seater swing sets that would have you feeling giddy as you eat, really as if you were up there in the heavens. Now, it's a totally different world. 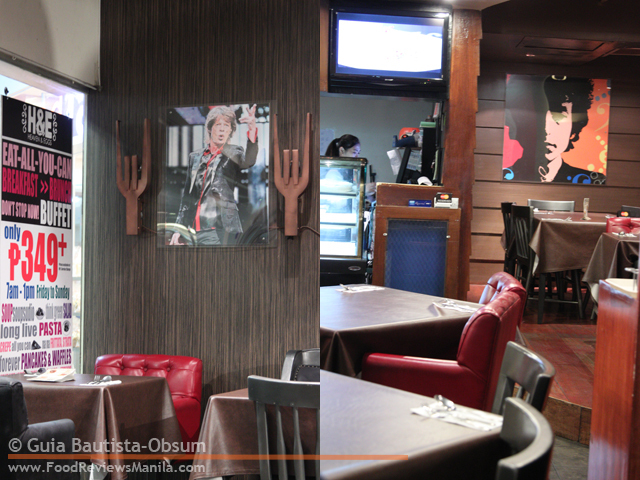 Posters and paintings of rock stars hang on every wall, as well as forks with tines folded "rocker" style; leather-like table cloths with dark brown chairs and red leather-covered seats. Dim lighting replaced what used to be a bright and sunny atmosphere. Fortunately, a great photographer friend of mine, Paolo Dolina, gave me a useful tip on custom white balance. And just in time too. 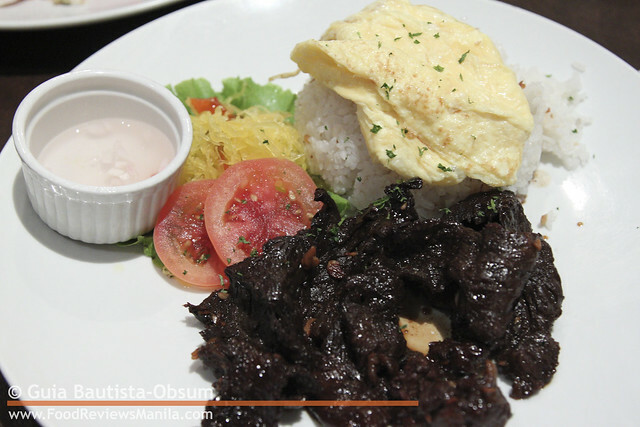 You don't go to Heaven & Eggs without trying their US Angus Tapa Special (P295). Perfectly marinated, the thinly sliced Angus beef just literally and magically melts in your mouth like a prime peace of meat would. At least it did back then. The change of scenery didn't bode well for their star dish. Even after several visits in hopes of finding a long, lost palatable experience, my latest (and last) attempt still proved to be in vain. The hard, tough meat lacked the delicate balance of the earthy, sweet, and zesty flavors of yore. 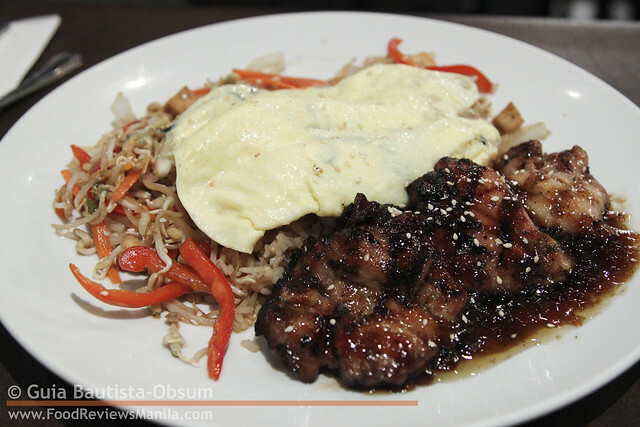 The Breakfast Teriyaki Chicken Platter (P265) showcases tender chicken imbued with sweet teriyaki glaze, poised beside a bed of soy rice and sauteed bean sprouts partly sheltered by a thin layer of pale colored omelette. The glimmering chicken bursts with ravishing sweetness; the egg providing abatement from the addicting flavor. The rice and bean sprouts married with the teriyaki chicken provides a perfect union of sorts that satiates the taste buds and satisfies the craving. Meanwhile, slices of turkey breast and honey cured ham nestled in between oozing layers of melted cheese and perfectly browned slices of bread, dusted with sugar powder greeted us warmly. The Full Monty Cristo Sandwich (P285) is definitely a favorite with its enticing layers of ingredients peeking along the sliced bread. 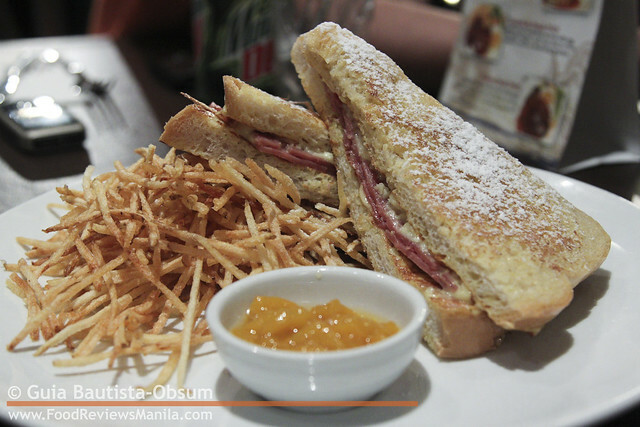 While the shoestring fries remain untouched, and the mango orange chutney hardly eaten, the sandwich left no traces on the plate aside from a few dots of the powdered sugar. Did somebody order pasta? Oh, it's the Korean Beef Stew (P245). It was a perfectly plated pasta dish, or so it seemed. What looked like spaghetti noodles and linguine turned out to be bean sprouts and thinly sliced scrambled eggs, interwoven with red bell peppers and julienned carrots. Chunks of beef and glistening fat were adorned sporadically around the plate. Underneath all the myriad of food elements was the rice drenched in salty sweet stew and more chunks of tender beef. 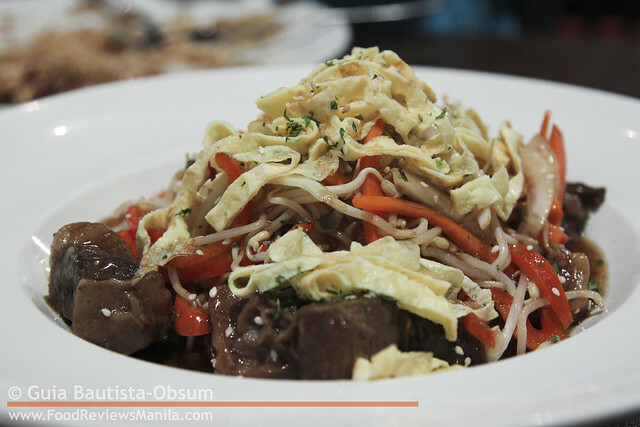 The taste was right in the middle of the angus-tapa-and-chicken-teriyaki flavor spectrum. Though the thick consistency of the ice cream wouldn't satisfy any thirst, combining it with rootbeer is always a welcome treat. Nothing will ever beat A&W's rootbeer float, but this Mug Rootbeer Float (P105) comes close. 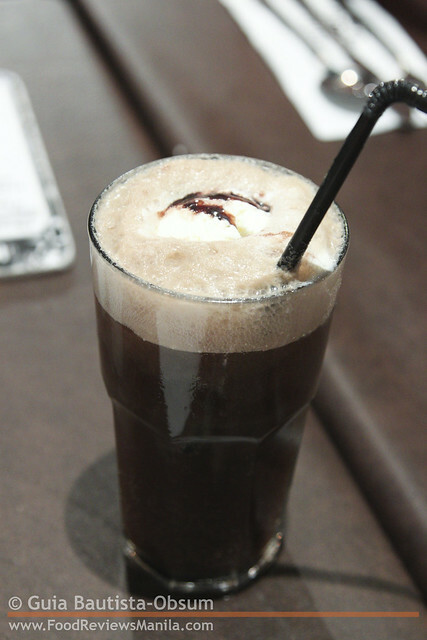 A globe of vanilla drizzled with chocolate syrup, drowns slowly in the bubble foam of the soda, gently merging with the rootbeer, lending its own additional sweetness to the carbonated drink. Utterly delightful! Ha?!? Nagbago pala ng interior design ang H&E. ate there several years ago but wasnt satisfied so we never came back. 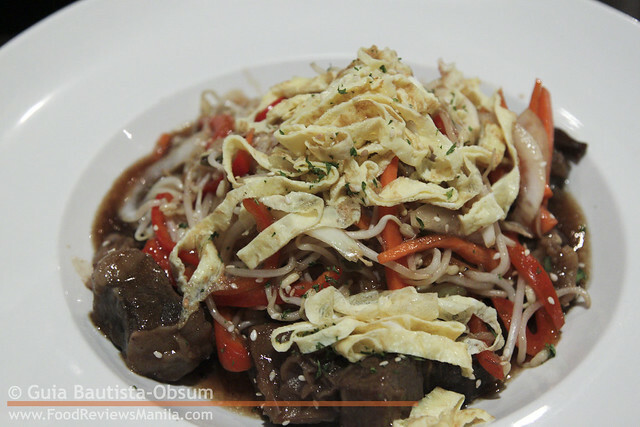 That tapsilog looks good, never tried angus on tapa yet. @Gita: Yeah, i wondered about that too. Why not change the name of the place?! Haha! I recently dined here and it was a horror! When I used their condiment shaker/bottle for Parmesan cheese, small insects instead of cheese came out of it! when they took my plate of spoiled food, they just replaced the plate without replacing the amount of food spoiled. I had to ask them to replace it! Horror!